This is another recipe that took me a long time to make because I never had green plantains on hand. Every time I went to the grocery store I would only find plantains that were too ripe and not green enough. And whenever I want to make a recipe with ripe plantains like tajadas or baked plantains with cheese and guava paste, I only find green. It’s so frustrating! The best news is that the day I decided to film this recipe I was finally able to find a few green plantains… well, kind of, because if you pay close attention to the photo you will see that one of them was starting to ripen. But the important thing is that I finally did it. And why be so persistent to make this recipe? It’s simple. Because it’s absolutely delicious. 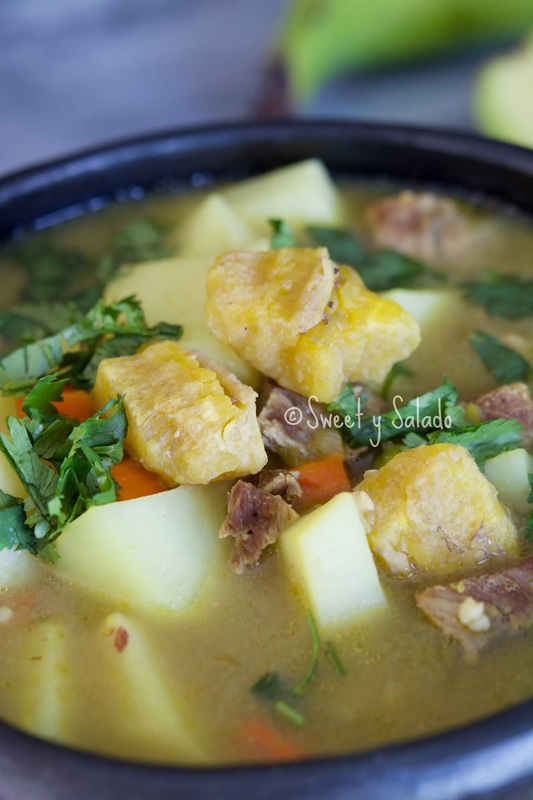 The green plantain gives it an amazing flavor, very similar to sancocho, especially if you make it with beef. 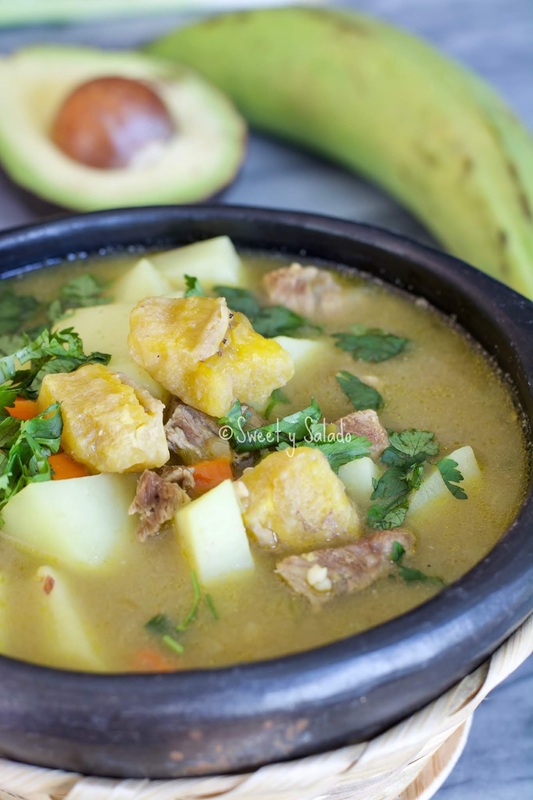 And the best part is, like with many Colombian soups, it’s not very complicated to make. You cook everything in one pot, you blend part of the green plantain and then serve it. It’s that easy. 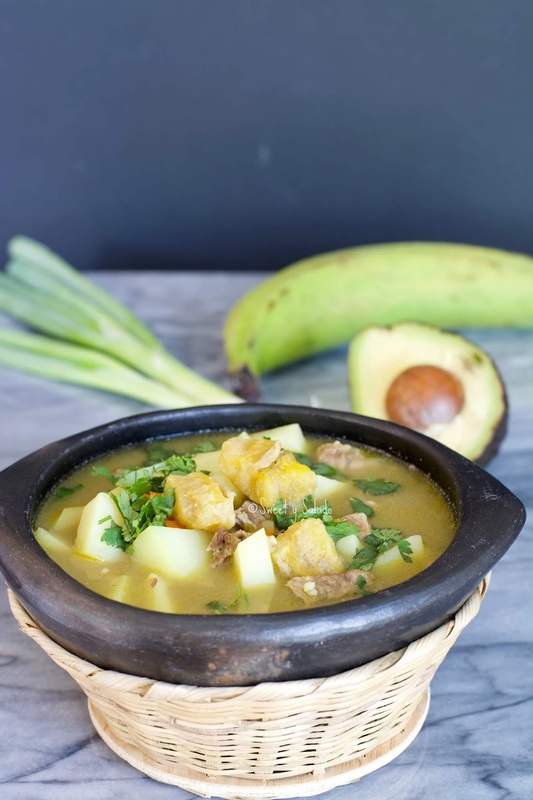 So, if you’re lucky enough to find green plantains at your local grocery store, this soup should be the first recipe I recommend you make with them. In a large pot heat the oil over medium heat. Add the white onion and cook for about 3 minutes or until it’s translucent. Now, add the green onion and garlic and cook for another minute. Add the carrot and food coloring and mix well. Add the water, all the plantain (chopped and whole) and the beef. Cover the pot, bring it to a boil over high heat, then reduce the heat to medium-low and cook for about 25-30 minutes. 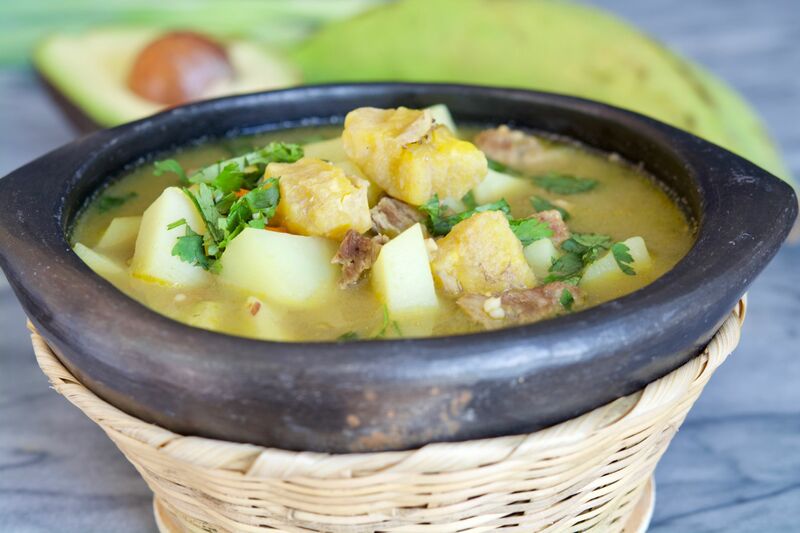 Take out the whole plantain and blend it with about ½ cup of the soup to make a puree. This intensifies the flavor and helps thicken the soup. Add the potato and sweet peas to the soup along with the plantain puree. Season with salt and pepper to taste. Cover the pot, bring it to a boil over high heat, then reduce the heat to medium-low and cook for about 15-20 minutes or until the potatoes are completely cooked. Taste again for seasoning and add more salt and pepper if needed. Serve immediately with chopped cilantro, white rice and avocado.